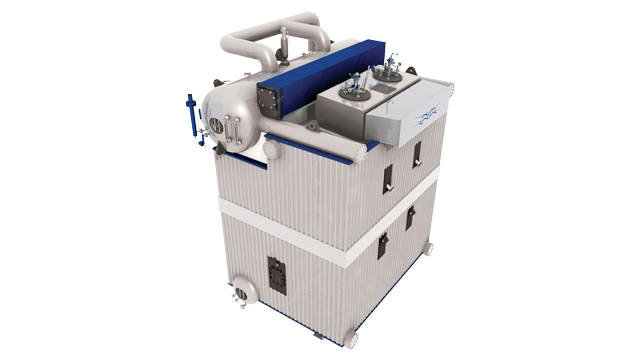 burner system can use both steam and air for fuel atomization and can be fired with multiple fuels (MDO/MGO, HFO, crude oil and fuel gases). The Aalborg D design is based on a vertical “D”-shaped boiler confi guration with steam and water drums interconnected via steam-generating tube banks. The furnace is made of membrane walls that form a fully water-cooled furnace. The convection section consists of straight pin tubes with bent pins, providing high heat transfer coefficient and low pressure loss. prevent overheating and tube burnout. Steam boiler operation is based on steam pressure control with feed-forward strategies and up to three element drum level control that provide quick-acting automatic operation. This ensures high steam quality, stable steam pressure and drum level control, even during boiler load changes. Hot water heater operation is based on discharge temperature control to ensure stable and reliable control in all heater load scenarios. The Aalborg D design is the ideal solution when large capacities are required for service steam, power generation and hot water heat exchange applications.